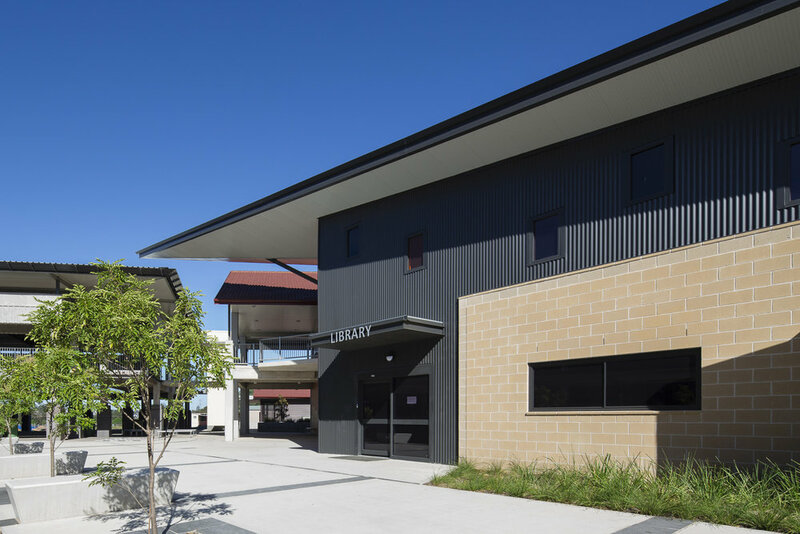 Mackintosh Photography has been photographing St Benedict’s Catholic College in Oran Park in Sydney's South West for numerous years during the development of the various stages designed by Fulton Trotter Architects in Bondi Sydney. The College is a new secondary school developed on a greenfield site in Sydney’s South-West. The architects developed a master plan for the site in 2011 to be completed across a number of stages. 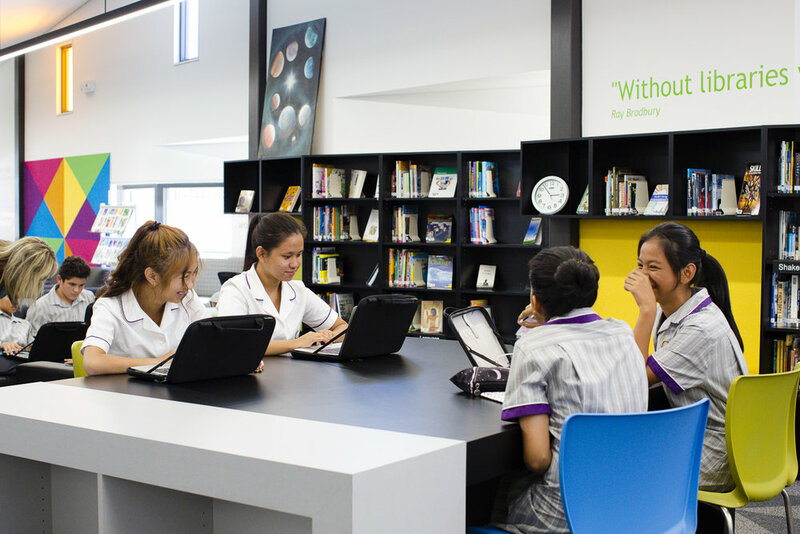 Previous stages have included a covered outdoor learning center, the School’s administration building, the science building including 6 teaching labs and associated prep areas, food and technology block, art's building and the latest stage 4 is the new school library building. 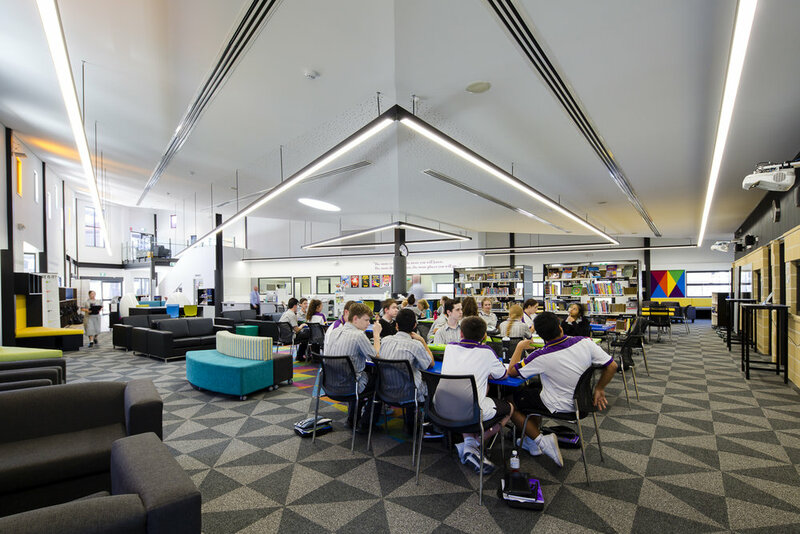 Colour is an important feature in the design of the library with bold colours throughout all the school, which brings learning spaces to fruition. It was used to create focal points, break up the learning space and to accentuate important elements found within the interior. I enjoy shooting this school and seeing it grow and develop. Almost like the school pupils themselves. The many architectural design features of the newly growing school features, bold colours with dynamic soaring roof lines and strong graphic signage all work to give the desired sense of presence to the school. Futon Trotter Architects will be entering this project into this year's Architectural Industry Awards. We regularly photograph architects completed projects and sometimes during construction. Architects commission photography of their projects for several reasons such as industry awards like The National Architecture Awards, to raise the practice's profile through marketing on their website and social media like Instagram. And of course to help win new business through showcasing the practices latest designs in their portfolio. Side view looking up at the dynamic roof line. This is one fun design element. Open spacers work with the studnet seating areas. Modern furnture help create a sence of fun. The ceiling features interesting design details and elements. This composition shows how the curves of the furniture with the bold patterns on the floor. Symmetrical elements feature strongly in the design and in the image. Students enjoying the space together. Looking down the staircase with the interconnecting walkway. Outside view of the reading Nooks. Where the library meets the outdoor learing centre. These trees are young, one day they will provide valable shade.